The Gouldian Finches or Lady Gouldians are thought by many to be one of the most beautiful of the finches and are some of the most colorful birds. Though the Gouldian Finches are not extremely difficult birds to keep, they are rather expensive and are generally kept by more experienced bird keepers. Gouldian Finches are also not too difficult to breed and will breed well in colonies or as pairs in cages. To learn to care for this bird, a beginner could start with the Zebra Finch. They are much less expensive and have very similar environment requirements and many of the same behaviors. Description: Gouldian Finches are 5.5" - 6"(14 -15 cm) with the females being a bit smaller. The males are the more colorful. The females are a bit duller, especially less intense in the breast color. Normal males have purple breasts, yellow bellies, and green bodies. The black-headed Gouldian is the most common in the wild, but about one out of four will have a red head and on a rare occasion, a yellow head. Breeders have developed a variety of color mutations including the white breasted, yellow-headed, rose breasted, blue breasted, blue bodied, and white bodied. The variations continue to grow. 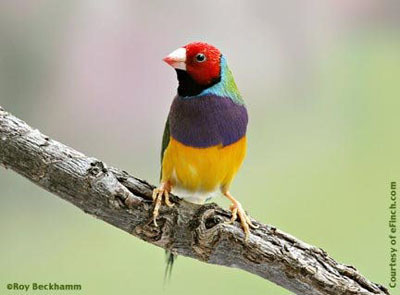 Distribution: Gouldian Finches are found in Queensland and Northern and Northwest Australia. A good finch seed mix will provide their everyday need of grass seeds and millets and is readily available at a pet store. They will need a good supply of protein, especially when they are molting or egg laying. In a treat cup you can occasionally offer supplements of diced hard boiled eggs, other egg foods, and mealworms. Seed moistened with cod liver oil and powdered with yeast will provide a high fat protein and vitamin D.
In a separate cup supply green foods such as lettuce, spinach, celery tops, and chickweed. Finch treats of seed with honey, fruits and vegetables are fun for your bird too, as well as nutritious! Grit with charcoal is essential to aid in digestion and it contains valuable minerals and trace elements. Grit should be provided in a special cup or sprinkled over the bottom of the cage floor. Provide a cuttlebone because the calcium it provides will give your bird a firm beak, strong eggshells when breeding, and will help prevent egg binding. The lime in the cuttlebone also aids in digestion. Give your Gouldian Finch a bath daily or as often as possible. A bath dish that is 1" deep with a 1/2" of water, or a clip on bath house is very important as they love to bathe. Housing: Gouldian Finches have a great need for movement. A cage with a good height as well as horizontal space is important. A minimum of 24" (60 cm) in height (necessary because they fly up when first taking off) and at least 28" (70 cm) long. Gouldians must to be kept in a heated area as they cannot tolerate cold, any dampness or drafts. Always keep the bird area above 55° F, though they will do much better if the temperature is kept at 77° F or warmer. Place the cage where it is well ventilated and against a wall at eye level. The cage should have good lighting but be away from doors and windows where direct exposure to sunlight can make it overly warm. Gouldian Finches also do very well in aviaries or bird rooms. In an outdoor aviary they need protection from wind and rain, a covered flight is best. The screening should be 3/8" square mesh. Dishes for food, water, grit and bathing water must be included along with perches and a wide variety of nests. Gouldian Finches may roost in nest boxes even when they are not breeding. Plants that are not poisonous, such as fruit trees, privet, forsythia, and honeysuckle bushes will make the space more enjoyable for the finches. Social Behaviors: Gouldian Finches are social and live in large groups all year long in the wild. They are friendly with other finches and do well when kept in groups. If you wish to mix bird types, they do very well in aviaries with Zebra Finches and Society Finches. Activities: Gouldian Finches are active and very energetic breeders. They must be kept active to remain healthy. Breeding/Reproduction: Gouldian Finches breed readily both in colonies and as a pair in a cage. Provide them with either open or covered nests. Nest boxes, larger than those used for Zebra or Society Finches, should be about 6"x 6"x 6" (15 x 15 x 15 cm) and mounted as high as possible. Both birds will build the nest and they will need nesting materials such as soft hay, sisal, and coconut fiber. Incandescent lighting tends to produce mostly males, while full-spectrum lighting helps produce a more equal number of males to females. Provide soaked seed, egg foods and spray millet when breeding. Gouldian Finches need more protein than other finches to stay healthy and it is especially important when the female is laying eggs. Females are prone to egg binding. This is thought to be caused by breeding too young, temperatures too low, or not in good shape. Some pairs will often keep breeding to exhaustion. They must be prevented from constant breeding in order to keep them healthy. The female will lay a clutch of 4 to 8 eggs and they will hatch in 14 to 15 days. The young leave the nest about 18 to 21 days after they hatch and in 6 to 8 weeks will be on their own, after their first molt. Their adult plumage comes in between 6 and 12 months. Potential Problems: Gouldian Finches, though not to hard to keep, are difficult to acclimate and will sometimes die for no apparent reason. They will suffer from metabolic problems if they don't get enough exercise, and can become ill after even a very short exposure to cold. Finches are fairly hardy birds and almost all illnesses can be traced to improper diet, dirty cages, and drafts. A balanced diet, being kept warm, and plenty of exercise will prevent most illnesses. Know your birds and watch for any changes as indications of illness. Some signs of illness to be aware of are droppings that are not black and white, feathers that are fluffed and the bird tucks it's head under it's wing, lack of appetite, wheezing, and acting feeble and run down. Some of the common illnesses and injuries your finch could contract are broken wings or legs, cuts and open wounds, overgrown beaks and nails, ingrown feathers, feather picking, metabolic problems from lack of exercise, weight loss, heat stroke, shock, concussion, egg binding, diarrhea, mites, colds, baldness, scaly legs, sore eyes, tumors, constipation, and diarrhea. Availability: Gouldian Finches have been quite expensive due to a high demand and the fact that they are captive bred. However, there are indications that there are now larger quantities being bred and that prices are reducing. The white-breasted and blue mutations are probably in the highest demand. I'm not a breeder but my Gouldian had 6 babies in Jan(2017) which I would like to rehome (reasonable $ or trade). Have 4 beautiful girls with red & black heads and 2 awesome boys with solid bright red heads. Able to breed now. Contact me @ Jodyshouse@yahoo.com In Concord, CA - will NOT ship. want to buy one pair of gouldian finch.please state the price in indian currency.